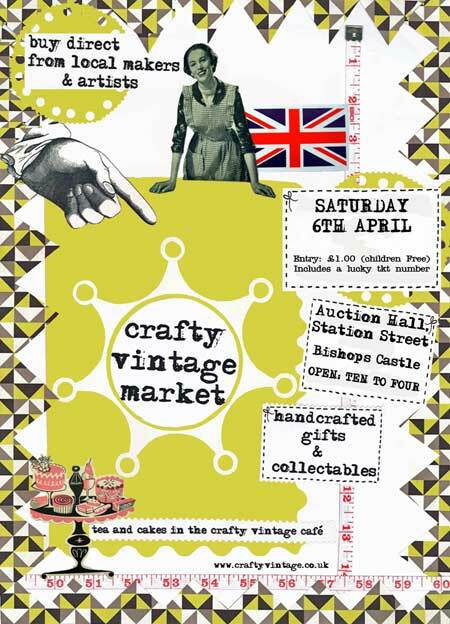 I’m looking forward to this, and we are hoping that we will have waved goodbye to this dismal weather and said hello to some sunshine in time to enjoy Crafty Vintage in Bishops Castle, Shropshire on Saturday 6th April. It’s a handpicked selection of fabulous vintage sellers and amazing crafters, plus tea and cakes too, of course. Open from 10am-4pm at the Auction Hall on Station Street. It’s a small town, you’ll find us…near the bottom of the town. Spot the bunting outside! I look forward to seeeing you! This entry was posted in Events and tagged bishops castle events, bishops gallery, craft market shropshire, crafty vintage, rural retro, The Whistling Cowgirl, vintage and handmade shropshire, vintage handmade, vintage style gifts.